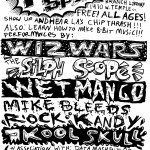 Chipmusician and performer KoolSkull has organized a free chiptune concert for all ages in Los Angeles, CA. The event kicks off Saturday at the Echo Park Library and includes performances from the following LA Based chiptune performers listed below, as well as a talk with the artists and a workshop for the tracking program LGPT (little gp tracker). It should be a great event for both long time chiptune fans and for those newcomers that are interested in learning more about the music and culture of chiptunes.